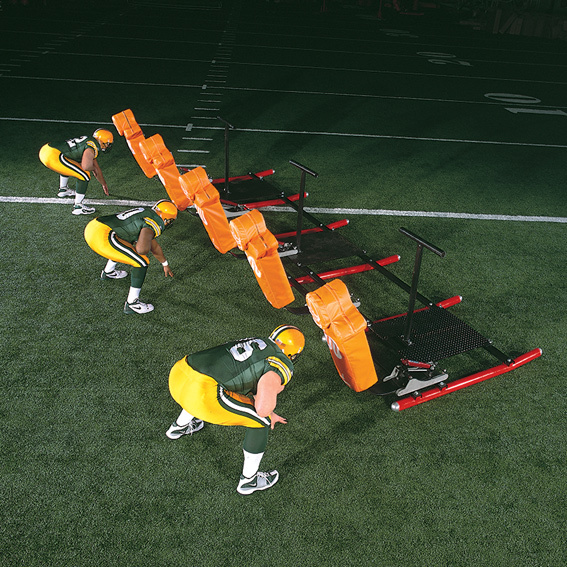 The 5-MAN SLED gives you the look of a “50” defense. Against this front, you can work your interior line on stance, take-off and leg drive. Wide pad spacing gives you the angles to execute any kind of block. From a head-up alignment, drive through the center of the pad to execute a drive block. From an outside shade, hit the pad at an angle and execute a reach block. Line up between the pads and execute a down or cut-off block. Pad splits 40". Sled length 20'. "The coaching point is to teach proper stance and alignment against realistic targets and resistance!"